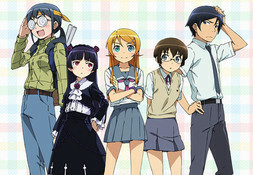 News: Anime News Network, which offers a streaming video service, will be streaming episodes of select series, like Oreimo and togainu no chi ~Bloody Curs~, which are currently airing in Japan.Views: It’s nice to see a trusted source entering the simulcast business. This offers yet another outlet to those who feel uncomfortable with watching fansubs to watch new series guilt-free. News: Anime columnist Maeda Hisashi tweeted her dislike of Oremio showing a teenage girl owning and playing multiple 18+ video games, which cannot legally be sold in Japan.Views: Oreimo in the news twice this week! It’s easy to get caught in the conventions of thinking only at a surface level while watching anime and also understanding that in reality, the law is not always followed. I think the more important conversation to have, though, is why Kirino’s parents in the show have no idea about her obsessive hobby; how much do your parents know about your anime habit (even if it’s not as deep as Kirino’s) and should they know?